Vothonas is a small rock village. 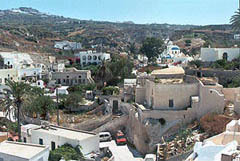 Architecturally, is the strangest village on Santorini and just for that reason worth a vist. Leading off it, a tangle of paths climb up to the houses, a complex of network of open and closed excavations, a unique and untouched architectural complex. As the coastal villagers did with the Caldera, so the people of the interior dug their houses into rocky walls of a ravine long. The village has a small church built inside a cave worth seeing. Another interesting place is the church of St. Anna which is the oldest in the village and it was built in 1827. The carved wooden screen is decorated with scenes from the Old Testament and it is very impressive.